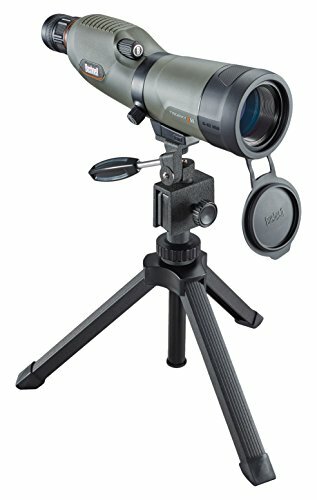 Bushnell Trophy Xtreme Spotting Scope, Green, 20-60 x 65mm | Spot On! The trophy Xtreme spotting scope 20-60x65mm provides extra power for extra range. The tough Xtreme hunting partner inherits the same rugged ergonomic design as the trophy binoculars with a waterproof rubber Armor construction. An adjustable sun-shade with built-in objective cover protects Big 65mm objective. Offers porro-prism design and zoom magnification up to 60x. Includes a compact tripod with window mount, a waterproof hard case, and a side-carry soft case.